The The largest-ever immunization campaign in the Middle East is under-way to stop an outbreak of polio in Syria from spreading throughout the region. In mid-October, 22 suspected cases of polio were detected in north east Syria. The virus has left 10 children paralysed. But U.N. health agencies warn hundreds of thousands of children across the region are at risk of contracting this crippling disease. Now, The World Health Organization and U.N. children’s agency are joining forces to immunize more than 20 million children in seven countries and territories during the coming six months. WHO Polio Eradication Program Spokeswoman Sona Bari notes the virus has been circulating in the region for some time, notably in Egypt, Israel and the West Bank and Gaza. But she says the outbreak in Syria, a country that had been polio-free for 14 years, has accelerated this emergency response in the region. Bari says emergency immunization campaigns to prevent transmission of polio and other preventable diseases have vaccinated more than 650,000 children in Syria. She says this includes 116,000 in the highly contested north-east Deir-ez Zor province where the polio outbreak was confirmed a week ago. According to Bari the campaigns fanning out throughout the region aim to vaccinate 22 million children. “This is a sustained six-month effort. There will be repeated campaigns over this period of time. It is going to need quite an intense period of activity to raise the immunity in a region that has been ravaged both by conflict in some parts, but also by large population movements. So, the virus is moving throughout the region,” she said. The WHO reports in the past few days, nearly 19,000 children under age five in Jordan’s Zaatari refugee camp have been vaccinated against polio. And, it says a nationwide campaign is currently under way to reach 3.5 million people with polio, measles, and rubella. 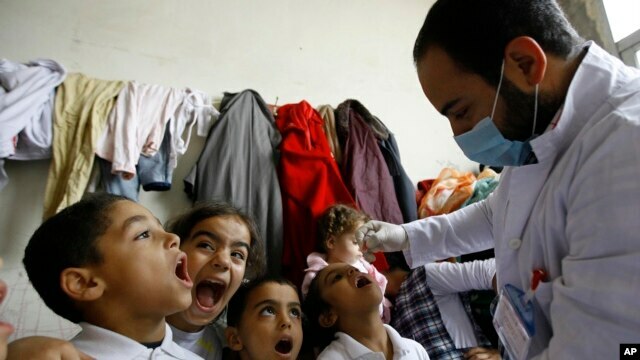 It says a vaccination campaign has started in western Iraq and soon will begin in the Kurdistan region. Lebanon, Turkey and Egypt also plan campaigns this month. The polio virus usually infects children in unsanitary conditions through faecal-oral transmission. It attacks the nerves and can kill or cause paralysis. There is no cure for polio, but it can be prevented through immunization. Bari says 12 suspected cases of polio are under investigation. She says preliminary evidence indicates the polio virus circulating in the region is of Pakistani origin. There have been media reports that Pakistani fighters brought the polio virus into Syria but the WHO spokeswoman said that is unlikely. “We are never going to know exactly how it arrived in Syria. What we do know is that we have seen a virus that is very similar in Egypt, in the West Bank and Gaza, and in Israel over the past 12 months. We also know that adults tend to have a much higher level of immunity already developed. So, it is unlikely that adults brought this in. It is probably more likely some other route. But, we will never really know for sure. All we can say for certain is that it is of Pakistani origin and that it has been in this region for a little while,” she said. Pakistan, Nigeria and Afghanistan are the last three endemic countries in the world, so it is from there that polio will continue to spread. Since WHO began its polio eradication campaign in 1988, vaccination has reduced this crippling disease by more than 99 percent globally. Despite this setback, Bari says the World Health Organization remains optimistic the outbreak can be stopped and polio, eventually, will be eradicated. This entry was posted in Child Health, Conflict Disabilities, Polio, Syria, World Health Organisation and tagged Bill & Malinda Gates Foundation, Disability Aid Abroad, International Disability NGO, Lebanon, Middle East, Polio, Voice of America on November 13, 2013 by disabilityaidabroad.